Aim and work towards your goal and you will never fail to achieve it. Aspirations to be an IIM graduate has always been there in my mind since my 10th grade and IIM Visakhapatnam helped my dream come true. It is a proud moment for any citizen in the country to graduate from prestigious institutes like the IIMs. I grew up near the beaches of Chennai, and Visakhapatnam, a beach city, is going to make me feel home always. Being the third cleanest city with beautiful beaches, a vast port and abundant nature definitely makes it a “City of destiny”. It’s been only a few years since the start of institute and it has already made a mark for itself as a highly developing one amongst IIMs. The growth and development in the Institute promises a bright future for its students. 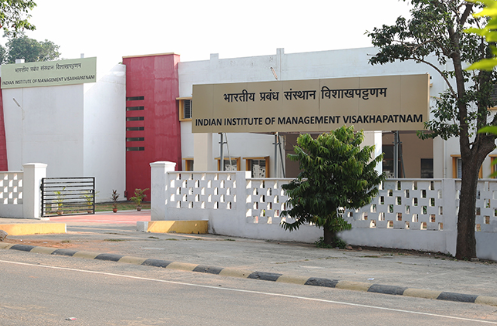 IIM-V gives me a great opportunity of being a part of two IIMs at one go. The young and growing institute coupled with the experienced mentorship from IIM Bangalore provides us both the essentials and details of a start-up as well as an established industry. The International Immersion Programme is an important factor that makes the institute very different and unique from the rest. It is going to leave an indelible impression in the minds of students teaching us how business works in an international environment, especially from leading countries in the world. This invaluable experience is truly a cherry on the cake for the student life at IIM-V.
IIM-V on the whole promises a holistic development for a career in management. The interactions so far with our seniors and batch mates through social media has been great. I’m excited for the tremendous two year journey. Grasim Industries Limited is the flagship subsidiary of the Aditya Birla Group. Grasim will give me the opportunity of being a part of multiple industries at a time. It started as a textiles manufacturer and has now diversified its area of business into multiple industries like Chemical, Cement and Financial Services. I would want to use my analytical and management skills in building and diversifying the company to every corner of the world. It’s a privilege to work for such a multi-faceted, large and established company.